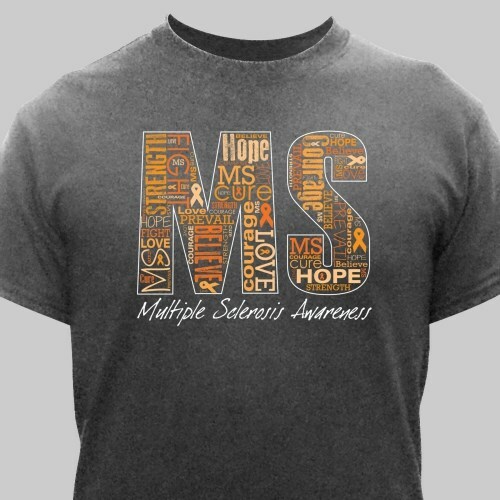 Wear this MS Awareness T-Shirt to show your support in finding the cure. This MS Word-Art design displays every word that is helping you on your journey. Let it be an inspirational reminder to never give up hope and always search for the cure. Our MS t-shirts are printed on premium, 100% cotton, machine washable t-shirts. Available sizes are youth XS-L and adult S-3XL. 4XL is available in white only. Loved these shirts, soft and they fit great! Everyone loved them! We love the t-shirts. Like the weight of the material and they washed very nicely.